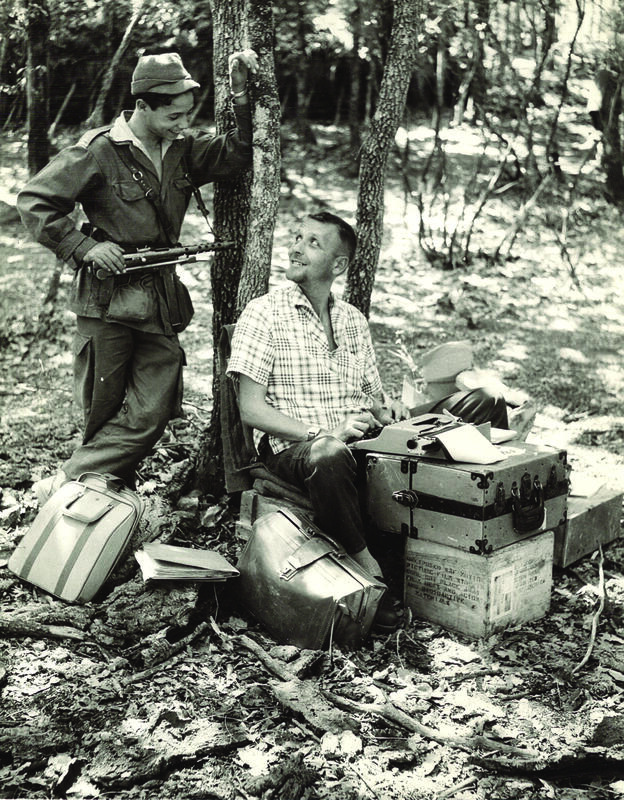 Frank Kearns with an insurgent in Algeria in 1957. Monday, September 30 at 7 p.m.
West Virginia University’s chapter of RTDNA (Radio Television Digital News Association) is hosting a screening of the Emmy award-winning documentary, Frank Kearns: American Correspondent. The event is free and open to the public. A panel discussion with the documentary’s writer, director, and producer Gerald Davis; producer and director of photography Chip Hitchcock; and editor John Nakashima will follow the screening. The documentary introduces the life and award-winning work of CBS News correspondent and former WVU School of Journalism professor Frank M. Kearns. For 20 years, beginning in the 1950s, Kearns reported for CBS News from Africa and the Middle East. In 1971, he returned to his alma mater in to teach and was named the distinguished Benedum Professor of Journalism. He retired in 1983. During that time, a former CBS news executive told Congress that Kearns also worked for the U.S. Central Intelligence Agency while he was reporting for CBS in the 1950s. Kearns denied this accusation until his death from cancer in 1986. This documentary premiered on West Virginia PBS and also aired on select PBS stations nationwide in 2012. It won a regional Emmy this year.